Serenity-IRC has a series of services available to all users which will aid you with registering and administering any nicknames and channels you choose to own. send and receive messages using MemoServ. decide what modes you want to use to protect your channel. send messages to a group of operators in a channel. opt to send any received memos to email. The illegal trade of software and pornographic files on the network, and the use of any nicknames or channels towards these banned activities is PROHIBITED on the Serenity-IRC network. Nicknames or channels deemed to be being used outside of the guidelines set out herein on this website and in connection notices or MOTDs on connection to Serenity-IRC servers maybe deleted or banished in the case of Nicknames or set secret or closed in the case of Channels. Publically accessible items such as nicknames, channel names, channel topics or conversations will be dealt with accordingly if deemed offensive. Channels set to secret (+s) by the Network will be invisible to other users. This can either be through the choice of the Channel Founder or forced by the network. 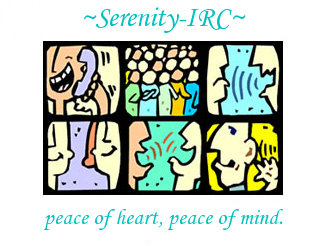 Content, conversations and activities carried out via the Serenity-IRC network either in private or in channel or otherwise are not controlled by or endorsed by Serenity-IRC and Serenity-IRC takes no responsibility for any claims or damages pertaining to these activities.